Israeli soldiers abducted, Tuesday, three Palestinian children, including two siblings for their homes in Qalqilia governorate, in the northern part of the occupied West Bank. The soldiers invaded Jayyous town, east of Qalqilia, searched homes and abducted Ezz Salah al-Qaddoumi, 17, and his brother Salah, 16. They also invaded and searched homes in Qalqilia city, and abducted Sajed Jibreel, 14. The soldiers interrogated several Palestinians during the invasions, and examined their ID cards, before taking the three children to an unknown destination. 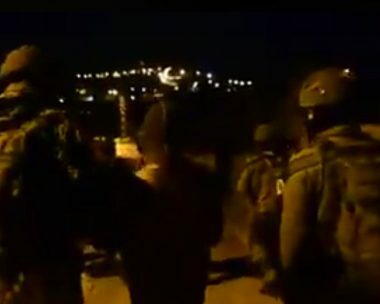 On Monday at night, the soldiers stopped a young man, identified as Ahmad Ziad Nazzal, at a military roadblock on the Jenin-Haifa Road, in northern West Bank, detained and interrogated him for several hours at the roadblock, before releasing him. The Palestinian is from Qabatia town south of Jenin.